So much to tell, but oh so sleepy. What a day! ﻿We arrived at the Disney All Star Sports complex this morning, got our tickets, then headed into the park. The boys were so excited. As soon as they saw the Disney signage, they began to light up. Gavin & Ethan, at the Disney All Star Sports Resort. Kristi & Ethan on the bus en route to Animal Kingdom. The first thing we did once in the park was rent a double stroller. It costs a pretty penny for a 7 day rental, but very worth it. The only time I heard "Pick me up Daddy!" was while watching the parade. Ethan and Gavin chillin'. While I strive to look as much like a tourist father as possible. At least I didn't have a fanny pack. 1 - From Gavin, while waiting to ride the Triceratop Twirl after realizing he could control how high it went. "Daddy, we can make it go up up and away, and down down and away!" Gavin waiting to ride the Triceratops Twirl. 2 - From Kristi, while discussing how weird it is that everyone just leaves their strollers, cameras, and other assorted stuff left unattended outside of rides. "It's not like someone's gonna steal it. You know everyone pays so much money to get in. You don't pay that kind of money to thieve." ﻿﻿﻿﻿﻿﻿﻿3 - We did have a couple small meltdowns during the day. Gavin decided he didn't much like the Bug's life 4D movie "It's Tough To Be A Bug". As soon as he saw the bad cricket, tears started to flow. Gavin & Kristi with their 3D glasses being honorary bugs. Ethan and a stranger digging for fossils in the boneyard. Me & Kristi at Disney almost 13 years since we were last here on our honeymoon. I love this lady. Me, Natalie, and Ethan ( They're almost hiding in the floor) on the "Dinosaur" ride, for the 3rd time. 4 - We'd been noticing how Disney goes the extra mile with everything. Kristi even noticed that their random bathroom at Animal Kingdom had an attendant to help at the baby diaper changing station. She exclaimed as she exited said bathroom "If you have a good experience in the bathroom, you know it's gonna be a great trip!" Well said, Kristi. You're not going to believe who rode this. 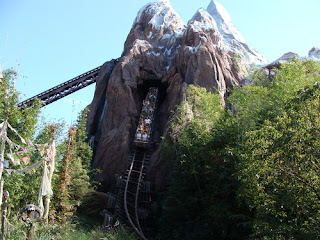 5 - One of the highlights of my day was riding Expedition Everest with Gavin. That's right. With Gavin. We were very careful not to call it a roller coaster. I just kept telling him it was a cool ride that was like a very fast train that goes up and down hills. He loves trains. He totally fell for it. He says it was his favorite ride, but he's not sure if he wants to ride it again. I was so proud of both him and Ethan for riding it so bravely. It's not about the destination. It's about the journey. No wait, this time it's totally about the destination. We've been planning this trip for years, and it's finally here. Today we began our Journey to Disney World in beautiful Orlando, FL. We left our house at 7:05 am and arrived in Orlando at 7:45. Yep almost 13 hours. To most folks this would have been a 10.5 hour drive, but with a 4 & 6 yr old, things never go as quickly as one might hope. 1 - 1 hour break at a Ruby Tuesday's in North Florida to watch the first (and best) quarter of the Iron Bowl. 3 - Stopping along the way to ship an item I'd sold on ebay and meeting the most talkative postal counter worker I've ever encountered. 4 - Seeing the billboard for the Sea World Christmas spectacular, because nothing says "Merry Christmas" like a killer whale jumping over a floating Christmas tree. 5 - And of course, an endless barage of questions like "How much longer Daddy?" My favorite such comment came from Gavin at approx 7:20 in Sumiton, AL. "I'm tired of riding in the car Daddy. How much longer?". We'd been in the car approx 15 minutes. I'm sure I'll have plenty of tales this week. On the agenda tomorrow... Disney's Animal Kingdom. We can hardly wait!